I saw her before she saw me, a woman with a shaved head and an open, engaging face. I watched, marveling at her confidence as she spoke to people, intrigued by the lines around her eyes. They seemed etched there, as though she were permanently on the cusp of laughing. Here was a woman who possessed joy without limit. I sat beside my friend Babs at a table piled high with handmade soaps and creams. I’d come to keep her company at the craft fair–a fundraiser for the temple. I followed the woman as she made her way to each vendor’s table. Babs sold soap, lip balm, and hand cream to a steady stream of shoppers, all women, many wearing yarmulkes. The bald woman also wore a yarmulke pinned to her head and I wondered, with a stab of guilt, did she have cancer? If so, what kind? Probably breast. Seems like everyone our age is getting breast cancer. She didn’t look sick, but sometimes cancer takes its time, allowing its victim moments of good health before rising up and taking over. Cancer always wins. I pushed the bitter thought away with another pang of guilt. There were no laugh lines around my eyes, only dark circles. When she reached our table, she joked with Babs, buying a tin of hand cream labeled Baby Jesus Whip. She told us she spent every day at the temple and I asked her what she did, even though I already suspected the answer. “I’m the rabbi,” she said. How? I thought, but was too afraid to ask. I grew up a secular Jew in the seventies and eighties in a neighborhood populated almost entirely by Italian Catholics. I know very little about Judaism, except that it deprived me of all the best holidays, the ones my friends got to celebrate. What I used to know, I’d forgotten. I’ve never seriously considered learning about my inherited religion, dismissing it as male dominated and patriarchal. How, then, could a warm, smiling, female rabbi be the head of this congregation? My ignorance embarrassed me, but the rabbi was kind, so I asked her something that had been on my mind since arriving at the craft fair an hour earlier. She’d been looking at me without judgement, enjoying the lesson, the corners of her eyes crinkling with an almost-smile. I felt the knot in my chest tighten, and the tears begin to fall and, though I don’t remember making a conscious decision to do it, I told her about my grief. I explained that my sweet, brilliant 15-year-old daughter had died eight months ago on a cold day in March. The tears escaped from some damaged center within me that I’d been carefully shoring up. I couldn’t stop them, couldn’t retract what I’d laid before this woman’s feet. Her expression grew pained, her eyes–those eyes–patient and filled with compassion, made me cry even harder. “I’m so, so sorry,” she said. She placed her shopping bags on the floor and stood with me while I wept. I’d thought that I had my grief in check. I’d thought that–being the nonreligious Jew that I am–I could come to a simple craft fair in a random temple and not feel the tug of longing that I’d been feeling since my daughter died. I’d been suppressing a need for spiritual guidance for months, burying it deep inside myself, hoping it would eventually vanish, but it had only grown larger. The yearning to express my grief to someone close to whatever it is we call god bubbled to the surface the minute I experienced the rabbi’s kindness. She had grown up in Israel. She had spent nine years in rabbinical school. She had been a rabbi for over 30 years. She was the mother of five children. She loved her congregants and they loved her. She was a woman who had spent her entire life living, learning, and teaching the spiritual culture that I had abandoned, and she did not judge me for this. I allowed myself to ponder what her life must be like–to live so close to the inner workings of the spirit, to have a map drawn out via ancient texts and rituals, to have faith. Could these things have helped me navigate my daughter’s death, her illness, her fear, and my own grief? But I didn’t have those things. I was bereft. So, I wept. I unleashed what I’d been holding onto for eight months–the fear that my daughter’s spirit had died with her, that my lack of religion had somehow condemned her to this fate, and that I was going crazy– looking for signs of her that weren’t there. “I’m sorry,” I said, trying to control my hiccupping sobs. “This is so big,” the rabbi said and invited me to meet with her the following week to discuss my questions of the soul. “I am a teacher,” she said and smiled again. “And we could just simply talk about your daughter.” The rabbi hugged me, picked up her bags, and moved on to another table. I was afraid to meet with her, afraid to expose how little I knew about being Jewish to this woman who knew everything, but the flood of emotion she’d inspired intrigued me. Surely, I needed to explore this more. Her office was warm and a little cluttered–a desk, rows of shelves, children’s drawings and certificates lined the walls. A loveseat and two comfortable chairs were tucked into one corner, a narrow coffee table between them. I sat down on the loveseat, feeling awkward and self-conscious. It had been two weeks since I’d melted down at the craft fair and I still felt emotionally fragile whenever I thought about that night. I was here for my daughter. I needed something to help me believe that her spirit wasn’t gone, even though the remains of her body sat in an urn on my mantel. In that moment, I realized that I was willing to visit every spiritual leader I could to answer my questions about the afterlife: Catholic priests, Buddhist monks, a Wiccan High Priest, mediums, psychics–they were all fair game. I craved the spiritual guidance that religion promised, if not the religion itself. But it was in the rabbi’s office I’d found myself that day. The echo of Judaism runs through my blood. As part of my heritage, it seemed the best place to start. I talked about the last year of Ana’s life and how I tried to learn everything I could about death and dying, so that Ana wouldn’t be scared. “I needed to guide her, but I had no guide,” I explained. I learned what I could from other parents, from books, and from a few healthcare professionals that weren’t afraid to answer my questions. I explained how this knowledge enabled us to keep Ana at home for the last months of her life, how she had died in her own bed, how hospice had told us not to call 911, but had given us the name of a local funeral home who would come get her body. I didn’t describe the pain of watching them carry Ana’s body downstairs on a stretcher or that I couldn’t bear to see them take her outside through the kitchen door and drive away to a place she’d never been before. She was alone, her body cold. I didn’t confess that I felt I’d failed Ana in that last moment. I should’ve gone with her to the funeral home, should’ve dressed her one final time, but I was afraid to feel her body stiffen and grow cold. “We had her cremated,” I said, bursting into tears. “Why does this make you cry?” she asked. The rabbi took my hands and told me it was okay. She explained that one of the reasons Jewish people don’t cremate their dead is because the traditional belief is that they will be resurrected when the messiah comes. “But if the messiah comes, which I personally don’t believe will ever happen, I think he’d be able to resurrect whoever he wants to resurrect,” the rabbi said with a smile. The rabbi went on to explain some of the stages of traditional Jewish mourning. There is Shivah, which I was already familiar with–a seven-day period of mourning after the burial, followed by a 30-day mourning period called a Shloshim. 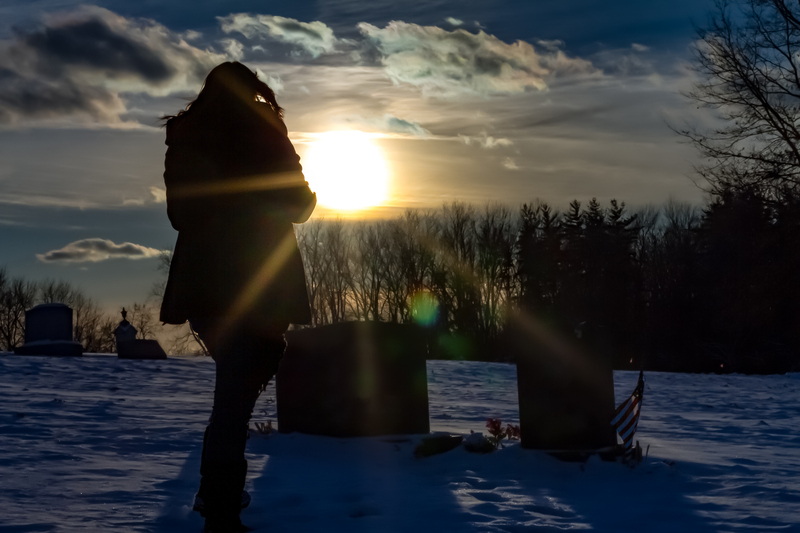 The entire first year is considered a time of mourning for close relatives of the deceased. “Let me show you the Mourner’s Kaddish,” she said and handed me a prayer typed on blue paper. I left with two copies of the Mourner’s Kaddish and a lot to think about. The rabbi invited me to come to a service anytime I wanted. That was two months ago and I haven’t gone back to see her. The one year anniversary of my daughter’s death was in March. In looking back on the day of her death and the weeks immediately following it, I realize that I made some decisions I deeply regret. I wish I had bathed and dressed her one last time. I wish we hadn’t had her cremated, but buried in a natural cemetery, directly in the earth. I wish I had known about the Mourner’s Kaddish. It would’ve made me realize, at the very least, that it’s normal to experience deep grief for a full year (why else would the Mourner’s Kaddish exist?) It would’ve given me the gift of ritual to help me connect with Ana’s spirit and accompany her soul on her new journey. I wish I had met the rabbi sooner. She helped me face the deep pain I experienced as a secular person who desperately craved spiritual guidance. She showed me, in her quiet, nonjudgmental way, that it was possible to believe in an afterlife without the trappings of god and religion. She accepted me, welcoming me into her congregation with open arms. She shared her knowledge willingly and with love, easing the burdens that weighed heavily on my soul. I have begun to allow myself the comfort of believing in spirituality without the burden of worshipping an all-knowing god. When I die, I plan to have my ashes buried beside Ana’s in the woods–in a natural cemetery just a few miles away from where Ana grew up. That knowledge is supremely comforting. For now, I’m learning to forgive myself the mistakes I made right after Ana died, because when you’re on a foreign path, sometimes you get lost. Jacqueline Dooley is a writer and entrepreneur located in New York’s Mid-Hudson Valley. Her essays on parenting a child with cancer and parental grief have appeared in The Washington Post, The Huffington Post, Longreads.com, Modern Loss and others. Ms. Dooley blogs about grief and her spiritual journey at thehalfwaypath.